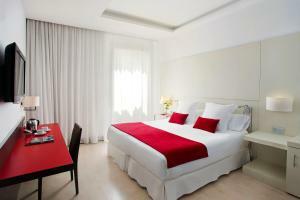 ELLA Guest House Barcelona is 300 metres from central Barcelona’s Tetuan Metro Station, and 10 minutes’ walk from Plaza Catalunya and the Rambla. It offers a sun terrace and free WiFi. Heated rooms at the ELLA are chic and basic. Some have shared bathroom facilities, and others offer a private bathroom with a shower, and air conditioning. The guest house serves a simple daily breakfast of pastries and biscuits. Throughout the day you can enjoy free tea and coffee. The ELLA Guest House Barcelona offers luggage storage facilities. From its central location you can walk to the vibrant Borne area in 15 minutes. You can also take a bus or metro to the city’s Barceloneta Beach, also 15 minutes away. When would you like to stay at ELLA Guest House Barcelona ? This spacious room offers a sink and access to a shared bathroom. This spacious, air-conditioned room offers a private bathroom and direct access to the sun terrace. This spacious room has a balcony, a sink and access to shared bathroom facilities. Please note that late check-in has the following extra charges: From 20:00 to 00:00: EUR 10 After 00:00: EUR 15 Please inform ELLA Guest House Barcelona in advance of your expected arrival time. You can use the Special Requests box when booking, or contact the property directly with the contact details provided in your confirmation. Each day we'll check prices and send you an email for your selected dates at ELLA Guest House Barcelona. If you don't have specific dates but would like to check prices for say next weekend or say next month we can check the price too. Click to write a review and share your experience of ELLA Guest House Barcelona with other travellers.